This entry was posted in Acceptance, Appreciation, Courage, Inspiration, Intention, Life, Motivation, Uncategorized and tagged Courage, Flourish, Happiness, Inspiration, Kindness, Life, Motivation. Bookmark the permalink. This Helen keller quote I used in a post. What insight and courage. If this gal can find this kind of reason for living , risking and thriving then I have to believe, we can heal and accomplish so much more than our ego wants us to believe. The human spirit possesses so much more for us to use to be here now present, experiencing all that is available. We are perfect all of us and on the same journey. Slow down be aware and enjoy the breaths we have been graanted. Don’t think just be and live. What a special quote you added…thank you. Helen Keller was such a remarkable person. And I really like how you relate the inspiration she provided to us for using in our everyday lives and challenges. Thanks so much for your ideas! ps…I lived/worked with deaf-blind and blind children at Perkins School for the Blind for one year and taught deaf-blind children for 7 years…tremendously inspiring children! A lovely post! Thanks for the encouragement. I LOVE Helen Keller’s quote. Got to remember that one. Thanks….Helen Keller was such a special person….a real inspiration. Thanks for visiting, too. Bring that experience and sort of intuition you gain from working with and providing support for others. That is a special place you did some very nice work. Tap into the inspiration and human spirit you touched and touched you. You are perfect and you will find this out through discovery about yourself. I see a truly amazing and caring person waiting to see the whole her without worry or care. Thank you for your kind words and ideas. Wonderful inspiration, thanks. I always like to read Desiderata as well…it works for me. I’m happy you found it inspiational. 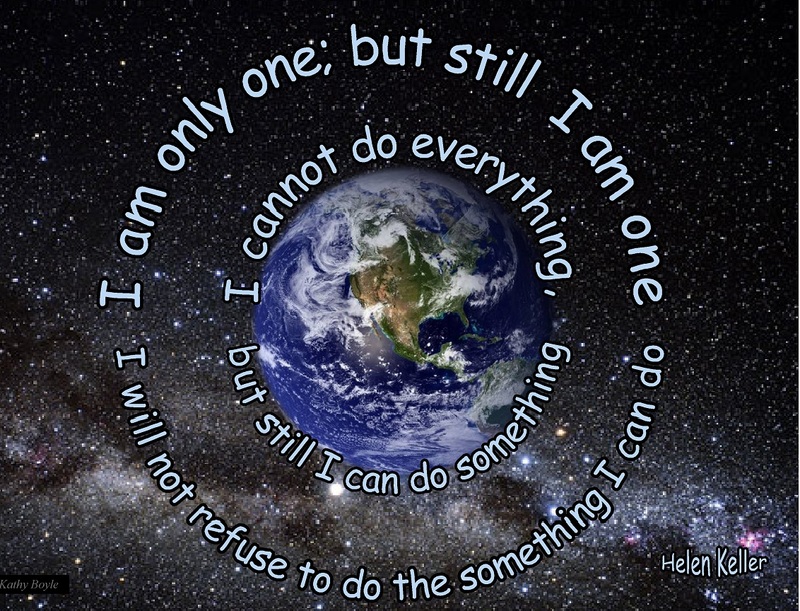 That image and Helen Keller quote have provided lots of inspiration and courage to me….especially the idea that I can contribute by doing “little things”. I had that Desiderata poster on my wall in the early 70’s… so special. Thanks for the reminder about it! Thank you, Kate…I guess this is an ongoing theme…maybe even the predominant theme…. of both blogs…not only to have that aspiration, but to develop the energy and courage to do so…. 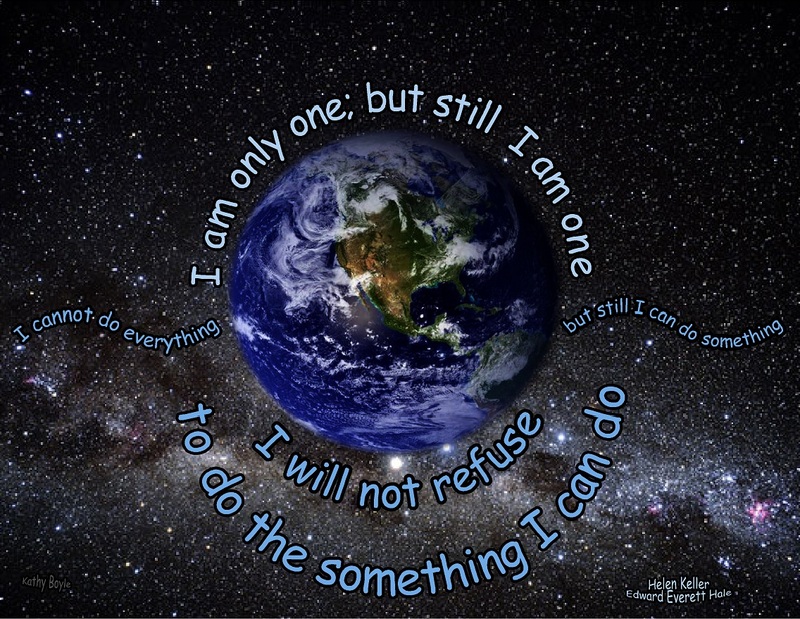 that quote gave me the original courage to start the blogs and to keep posting pages that I had made for myself, or the kids I teach…and found helpful…it was a HUGE leap of courage to show them to others……but I just kept looking back at that image of the earth with the quote around it…and kept adding each day….